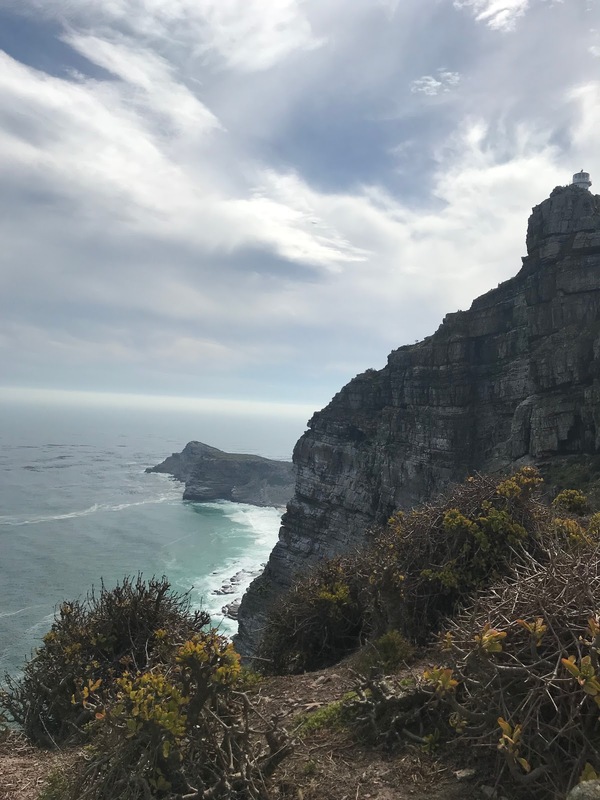 At the near tip of the Cape of Good Hope in South Africa, you can view where the Indian and Atlantic Oceans often times tempestuously meet. The point is often called the "Crossroads of the World." 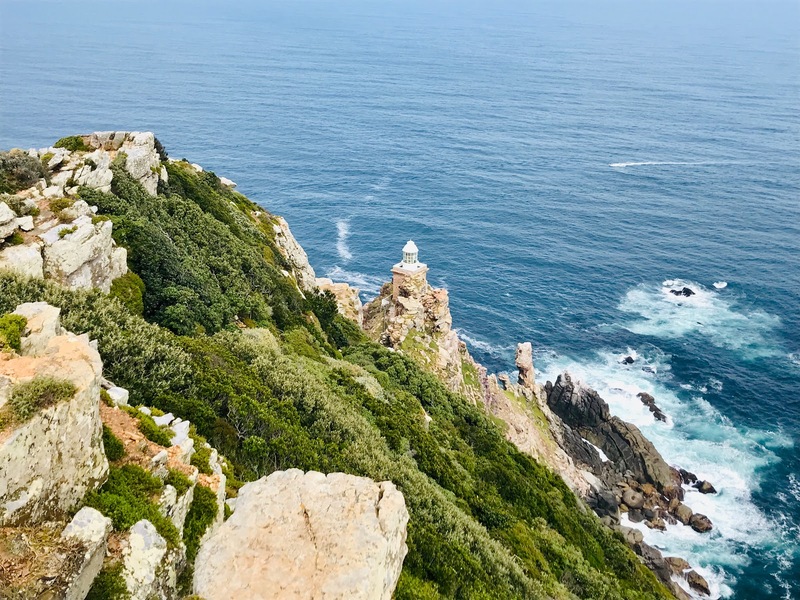 In fact, the Cape route was formerly named the Cape of Storms in the late 15th century where ships feared to sail around it. Hundreds of ships sank in its gusty gales. Undetected rocks hide the dangerous crevices below the ocean where unknowing ships tried to navigate. Another reason for the turbulent, wild waves is the cool Bengula and warm Agulhas currents that meet together at the Cape. 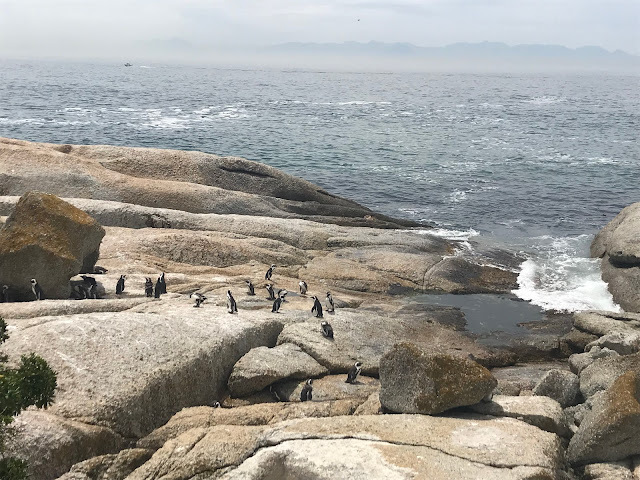 The blend of Indian warm and Antartic cold currents provide a treasure chest of marine life that invites some of the best ocean bird watching in the world. Not to mention the soul-stopping scenery. 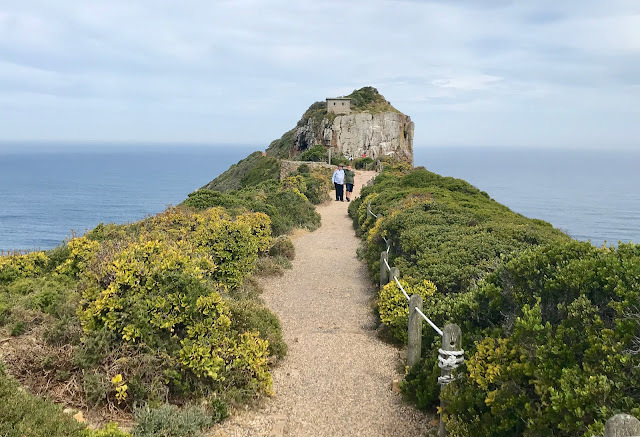 Walking out on the narrow, rocky promontory, with two cliffs to the sides of you, is a geography of many worlds meeting. Sometimes the small peninsula is even closed for tourists with ripping winds and raging waves. 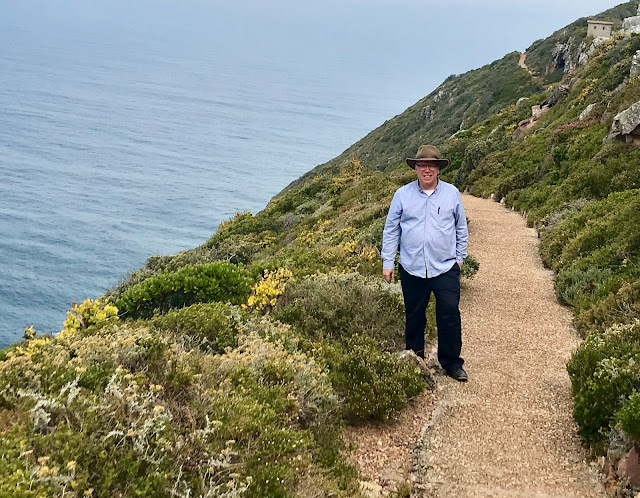 On an early November (spring) day, I felt lucky to walk the trail to see the expanse of azure blue almost surrounding us. African peregrine falcons, rock kestrels, and kelp gulls glide below and above you. Since it was springtime, we viewed some of the most unusual, unique flowers (or fynbos) and vegetation I have ever seen. Eighty percent of the vegetation on the southern shores of South Africa you can not see anywhere else in the world. The biodiversity is more than any rainforest in the Amazon. At the bottom of the cliffs, you can see ostriches, tortoises, oryx--and penguins. It is a paradise of nature. Strutting penguins on the Cape. 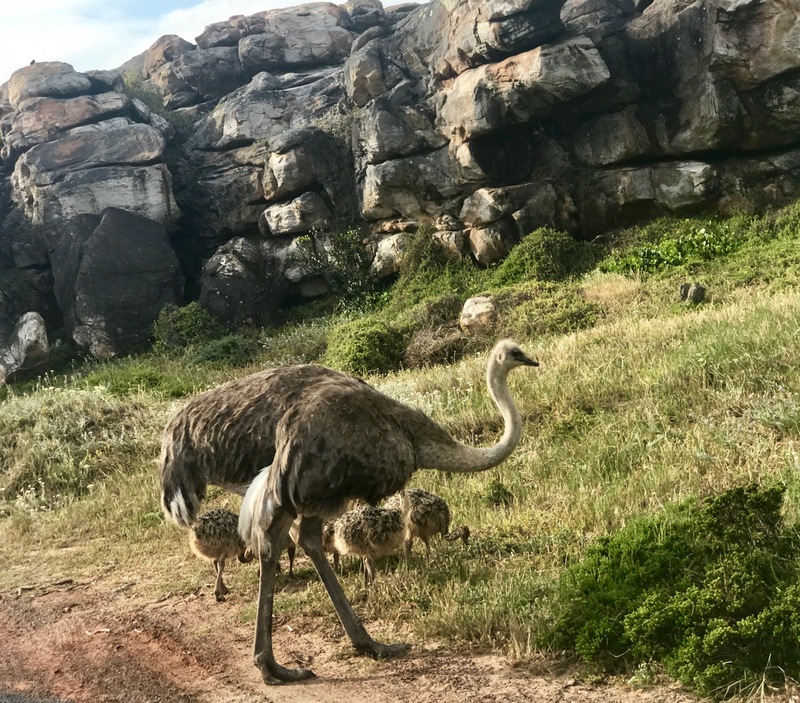 Running into an ostrich family. We heard the mother calling for her babies when they were too far from her. Out on the rocky promontory, with the two lighthouses on the peak (one was not enough for the venturing ships), I thought of the dramatic tension of nature that meets here: the quartz cliffs and pounding waves, and the two intermingling currents of warm and cold. As my friend, David Pulsipher reflected, "Conflict and tension have the magnificent ability to become uncommon beauty in Nature, as in the ebbing light and darkness, with a sunrise or sunset. A lesson Nature gives us is the same in our our relationships. Conflict, vast differences, and tension ultimately can form heart-pounding beauty--if we allow it." And although the physical colliding of Nature can seem threatening, the tension can give unexpected resplendence too--in a masterpiece of color and splendor. The same analogy goes for people, nations, communities. If Nature teaches us that conflicting forces can ultimately bring a South African biodiversity that is uniquely beautiful, I believe we as humans on this earth can do the same. We can converge and even love in our differences. When divergent views occur, we can remember the magnificent panoramas that can happen when we unite. As we meet together in that momentary tautness of time when potential sparks can come, we can choose instead to find opportunities to merge ideas. That is when the beauty comes. Sunrises, rivers, shorelines are where tension and opposing energies come together in sublime landscapes. Fortunately, we humans too have the choice and chance to create beauty and strength with our differences. The striking landscapes in South Africa could never have happened if it were not for Nature's clashes. And that is why I am glad King John II from Portugal changed the southern-west tip of South Africa's name from the Cape of Storms to the Cape of Hope. It brings me hope that we humans can do it too. On the day we were there, the waves were tranquil. 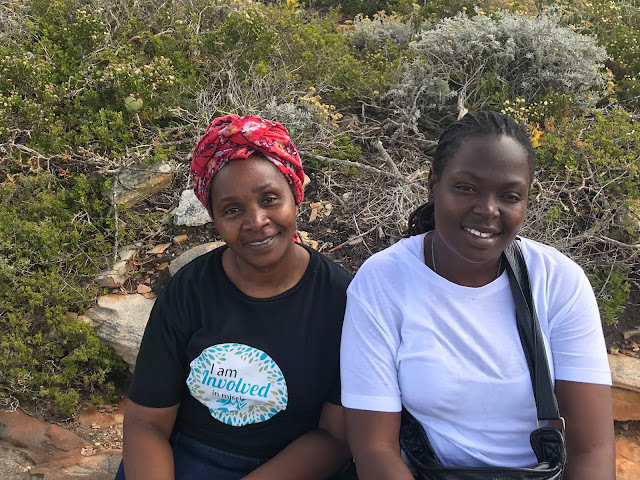 A lovely mother and daughter who I met on our hike. They were from Cape Town, and it was their first time to gaze on the two oceans.